SOHP’s newest field scholar, Kimber Thomas, has been busy researching historic African American communities and cultures. As an American Studies graduate student and field scholar at SOHP, Kimber spent the summer researching with the Historic Black Towns and Settlements Alliance (HBTSA). This organization currently focuses on preserving the history of and connecting communities in five historic towns: Hobson City, Ala.; Eatonville, Fla.; Grambling, La., Tuskeegee, Ala and Mound Bayou, Miss. HBTSA partnered with UNC last year, making way for graduate and undergraduate students at UNC to be directly involved with the research and preservation efforts. Kimber spent her summer in her home state, researching Mound Bayou, Mississippi. 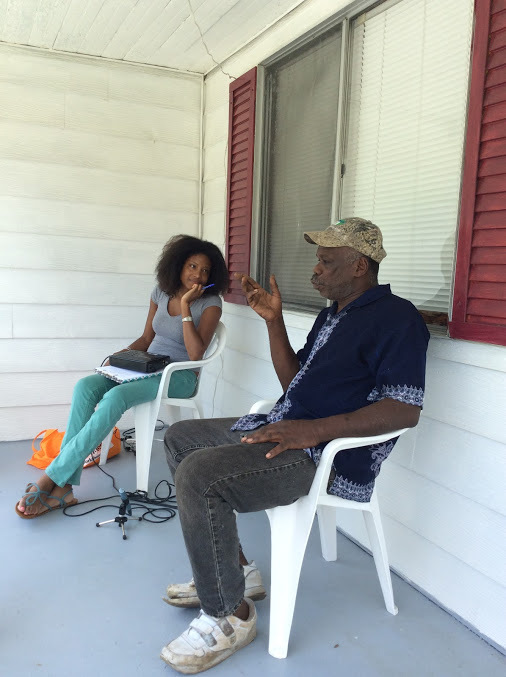 Mound Bayou’s history as an independent black town remains largely unspecified. Kimber’s research focused on the lives of Mound Bayou’s founders and pioneering settlers. She mined informal and formal archives such as town hall documents, cemetery records, and obituaries to begin piecing together comprehensive social history of Mound Bayou. “It was tough work, because it isn’t all in one place”, she said about beginning research in Mound Bayou. Kimber generated an online forum for entering information on Mound Bayou pioneering residents when information is found. With the help of three undergraduate Robertson scholars, who processed archival information and worked part-time in the Mound Bayou community center, Kimber was able to assess existing archival information as well as engage with the community. 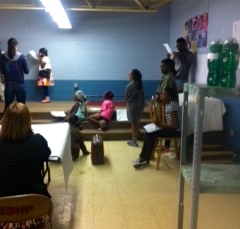 At the community center, the undergraduate assistants brought the story of the founding of Mound Bayou to life by writing and directing a play for the St. Gabriel community center youth summer program. HBTSA and UNC are committed to a long-term involvement with the historic towns. Thus, Kimber’s summer research is the beginning of long-term plan to build a digital humanities online database accessible to both university students and the community. Kimber speaks about her research with passion, reminding us that “these towns are here, so we need to start preserving and appreciating the history. Being party to, or even sharing, the story of “what happened” is not enough. History requires access to the venues and institutions through which stories can enter the public sphere. What I am suggesting is that there is a certain legitimacy that comes along with being “out there”, on the record. Think about that one sensational story that circulates in your own family about a relative who did something grand back in the day—a grandfather who was an alleged spy for the CIA, an uncle who was secretly Martin Luther King’s best friend and confidant, a great-grandmother who passed for black or white but was actually full-blood Cherokee. Although they are often quite captivating, these stories only have currency in the private sphere, for they belong to the families, friends and communities that share a connection with them. And the traces of “what happened” are often embodied in repertoire: casual storytelling, song, dance, gestures, jokes, silences, and repetition. But they do not necessarily become a part of history. In my own work I have come to think a lot about how some people’s experiences comes to earn the status of history—a public artifact—while other folk’s lives and memories remain private goods—invisible, tenuously believable, and slippery in hands of history. Here’s an example. My research is based on the African American experience in and through Appalachia. When I turned to the archive, the media, and to the historical record to get started on my scholarly journey, I was disappointed to find a bounty of imbalanced representations of the white, toothless, backwards mountaineer, a trope that has continued to titillate the American imagination when it comes to the people of Appalachia. But where were the black folks? In fact, I personally knew Appalachia to be a diverse place that embodied a long history of Native American, European, Jewish, and recently Asian, Latino and Indian migrations. I knew about this diversity because my own mother and father were born in “bloody Harlan County,” an infamous coal mining community in the Appalachian region of southeastern Kentucky. And, like the thousands of other families in their community at the time, they were the children of black coal miners. Yet the disparaging image of the hillbilly persists. It was through these early encounters with the archive that I learned that history is largely a matter of who has the pen: Who gets to make history? Who gets to write about whom? And on what terms? This is why I became an oral historian. I took up the challenge of reconstructing the rich history of the African Americans who lived and worked in the company-owned coal towns of eastern Kentucky during the first half of the 20th century. 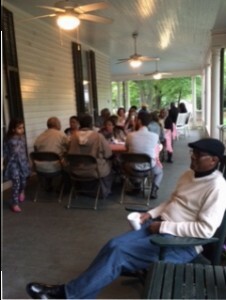 As a descendant of coalminers’ sons and daughters, I was already familiar with many of the African American families, stories, and traditions that were associated with the region. But if there was to be a history of this experience, we had to make it. Oral history was the only way to go about accomplishing this goal. I got an old-school Marantz plug-in audio recorder and hit the road. I of course went back to Harlan County to interview the few folks who still lived there, but due to the precipitous decline of the coal mining industry in the mid 20th century, few black families remain in the region. So I spent the last two years traveling across the country, from Newington, CT to San Jose, CA and everywhere in-between, conducting oral history interviews with the descendants of black coal miners from eastern Kentucky. I found that my participants were living archives. 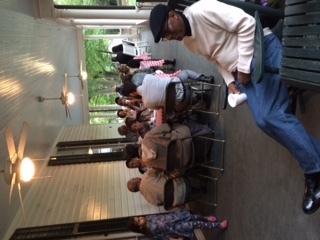 Now in their 60s, 70s, and 80s, they not only lived through the experience of growing up as black children in Appalachia, they also witnessed, lived, and were party to some of the greatest transformations of the 20th century—events such as the African American Great Migration, school desegregation, the urbanization of the American city, the pre- and post-Civil Rights era, and the election of the first black President. I learned early on that if I really wanted to get their story right, I had to learn to listen. Listening is not a passive act. It requires sincerity, energy, care and humility (a practice that is easier said than done for us academics who are in the business of being know-it-alls). Listening is an act of giving. This was a game-changing epiphany for me, because it made me question my role as a researcher. Who was really in charge here? Oral history opened up the space for my participants and I to co-create historical records through relationship. As opposed to sharing a document to convey “what happened,” the participant becomes the author of his or her own history through storytelling—sharing moments of success and triumph, disappointment and shame, turning points, drama, and regrets. In my opinion, oral history is the most capacious instrument for capturing the complexity, and the sheer messiness, of life. Over 200 interviews later, I finished my cross-country oral history spree, and have since turned my attention to working on my first book manuscript about Kentucky’s coal camp blacks. But the oral histories I collected are way too good to keep to myself. History is a public artifact, right? So in 2013, I founded the Eastern Kentucky African American Migration Project (EKAAMP) in partnership with the Southern Historical Collection here at UNC Chapel Hill. Through this partnership we embarked on the journey of forming one of the institution’s first participatory archives—a practice through which communities take an active role in transmitting their history through archival preservation. 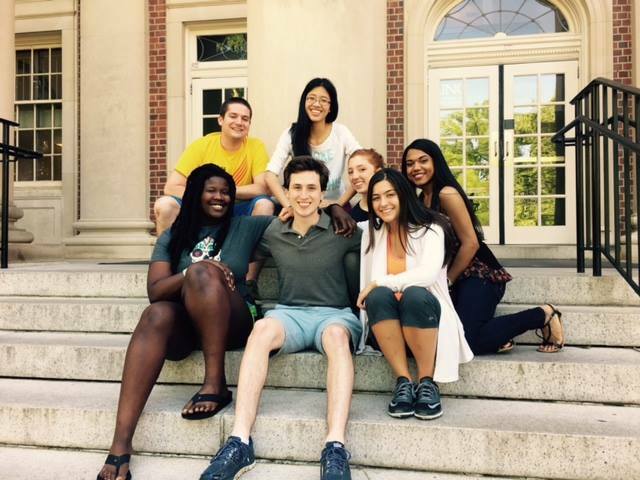 In two short years, EKAAMP has blossomed in into a thing of its own. In addition to the collection of oral history interviews that I recorded for the project, individual participants have donated thousands of documents, photographs, and objects to the collection to ensure that their contributions to Appalachian and American history would not die with them. To that end, the EKAAMP collection will be made available to the public through the Southern Historical Collection at Wilson Library here in Chapel Hill. 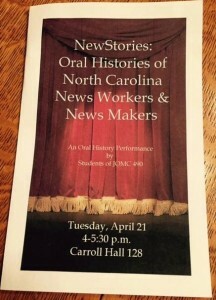 “Let’s put on a show!” No kidding—that was the response of my students when I (timidly) proposed adding a performance component to NewStories, an oral history course I teach in the School of Media and Journalism. 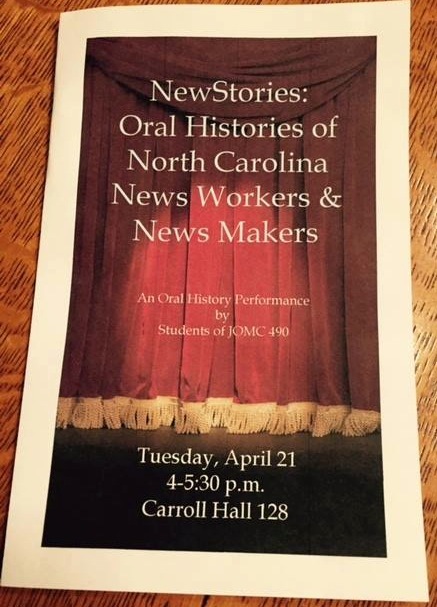 I knew students who had participated in oral history performances and the benefits were clear. Students were connecting with history in a deeply personal way, noticing thematic overlaps in their narrators’ experiences, and bringing their stories to life for an audience outside the archives. We turned our attention to performance only after the students immersed themselves in the principles and practices of oral history and its uses by journalists and media historians. I relied heavily on Della Pollock’s account of performing “Like a Family,” and her edited collection, Remembering: Oral History Performance. It certainly helped that one of my nine students was a reporter for Carolina Week, a student-produced news broadcast, and a dramatic arts minor with acting experience, and that two others were broadcast communication majors with training in scriptwriting and public speaking. Evan Faulkenbury, a doctoral candidate in history and SOHP field scholar, helped the students tease out the themes of their interviews, complicated by the fact that their narrators ranged widely in age (43 to 87) and hailed from all facets of the media industry (think CNN and a country weekly). They settled on two themes and divided into groups to begin writing a script, using excerpts from their interviews to convey the ways that their narrators had met personal and professional challenges. After many rehearsals and reserving space for the performance (fittingly, the Halls of Fame room in Carroll Hall), the students sent personalized invitations to their narrators. 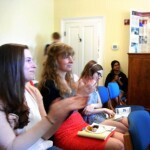 In addition, they invited faculty, staff, parents and friends to attend. They designed a program with a brief description of the course and the names of the performers and interviewees. We dedicated 90 minutes to the entire event, allowing 30 minutes for the performance and time before and after for informal conversation. We had a few glitches, but nothing major. One of the narrators in attendance, a former editor of the Greensboro News & Record who presided over mass layoffs there, said that the interview encouraged him to revisit that difficult period and consider its long-term impact on himself and others. Another narrator remarked that regardless of the period in which they worked, all of the interviewees had described challenges posed by the introduction of new technology. “I didn’t care about wanting it for the mix, but I wanted it for equal rights. I wanted my children to have equal rights. If they would give me equal rights over here, I wouldn’t think about going over there.” – Vennie Moore on the integration of schools in Davidson, North Carolina. As a “mining the archives” intern for the SOHP, I’ve spent hours this semester listening to first-hand accounts of the desegregation of North Carolina schools. I have heard the voices of students, teachers, athletic coaches, administrators, parents, community members, and church leaders as they relive their past, describing their views, involvement, and experiences with integration. I’ve come to especially appreciate the quote above by Vennie Moore because I feel it has captured much of what I have learned through these interviews: though the previous policy had been separate but equal, African American educational opportunities and facilities were nothing close to equal; not everyone was in support of integration for the same reasons, if they were in support at all; there was hesitation and fear by all involved; there was a fear by African Americans that their heritage and traditions would be covered, not combined, by the history of previously white schools. Why? The reasons for integration were many: Brown v. Board of Education’s overturning of the separate but equal policy, a desire to correct the unfair institution that had defined the North Carolina school systems, like the rest of the United States, for far too long, or, like Vennie Moore, the knowledge that this was the only way African Americans would be able to truly have an equal opportunity for education. How? Turbulence; outstanding individuals; understanding; danger; compromise; a driving sense of morality: these are just a few words that describe the integration of North Carolina schools. Though morally correct, the process of integration was difficult to navigate for everyone involved, having little precedent to follow. It was only through the excellence of understanding students, teachers, administration, and community members, the unifying power of athletics, and inspiring people’s refusal to settle for anything other than equal conditions any longer that made integration possible. nd minority experiences than any textbook or major publication could present me with. This is what I have come to understand the value of oral history as in my time here: a way to preserve the differing experiences of all types of people in order to gain a full understanding of historical event. I had never been to Eli Whitney before. Named for the inventor of the cotton gin, Eli Whitney is a hamlet – a crossroads, really – in rural Alamance County, North Carolina. You get there from Chapel Hill by heading due west on Old Greensboro Road for about seventeen miles until it runs into Highway 87. But half a mile before you get there, on the right side of the road you’ll see Concord United Methodist Church. The church sits just before a bend in the road, right next to its cemetery. It’s a small, red brick building with a white steeple, finished in 1961. If you pull into the church’s gravel lot, you’ll see a garden. The garden was what brought me there on March 12, 2015. I was there to interview Donna Poe. I arrived early, so I parked and walked through the cemetery, around the church, and up to the garden. There were two large sections filled with a variety of fruits and vegetables, and at the end was a cross. Donna pulled up in her pick-up truck after I had lingered only a minute. Poe was in charge of the community garden. She started it only a few years ago through the church, but its popularity had soared. She organizes three workdays per week, and anyone who joins takes home a share of the bounty. Earlier in the month, I had emailed dozens of pastors at churches across the region, asking if they had extraordinary women members who would like to be interviewed for my project on conservative grassroots activism. Donna Poe’s minister recommended her, not as a typical political or social activist, but someone whose faith makes a real difference in the community. We went inside the church to have the interview. Donna was born on October 13, 1962 in Albany, New York, but home for her had been Spring Hill, Florida. She told me about her family, her work, and how she ended up in North Carolina, moving up here seven years ago with her husband to be closer to her sister. The implication was that Donna and her family was going to hell if they did not know Jesus. Angry and hurt, they did not return to church for a long time. Years later, a friend led Donna in a prayer to become born-again. Now, she and her husband are active members at Concord United Methodist Church. 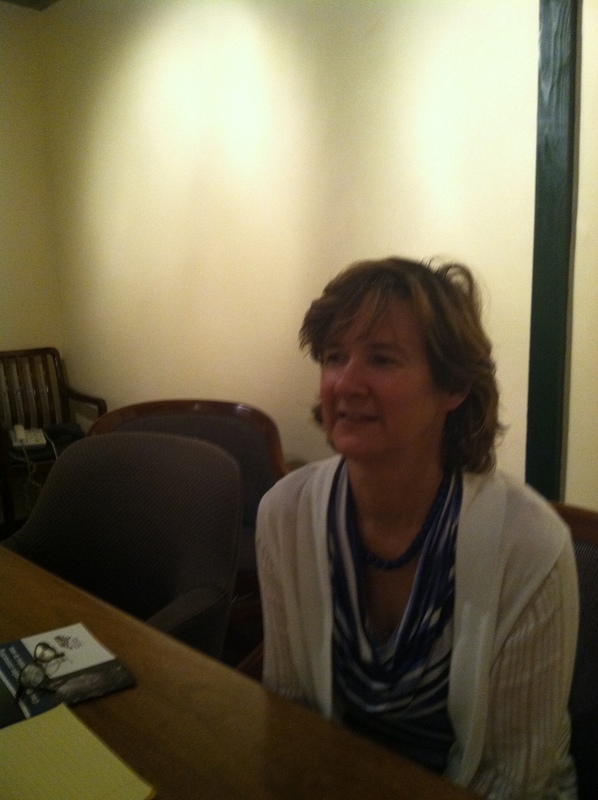 Donna’s story was a personal testimony about how she came to know God, a different kind of oral history. She realized that all along, sometimes at odd moments, God was “planting seeds” in her life. The odd Christmas service was one time among many when, looking back, she could “see His presence” guiding her, planting seeds, leading her to where she is today. 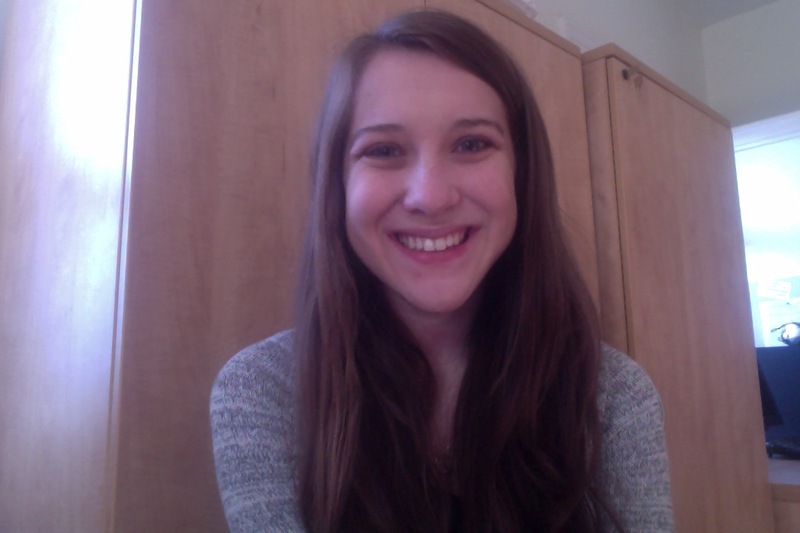 This blog post was written by SOHP Intern Holly Plouff. Talk/make noise as little as possible- The interview isn’t about you. It’s about this endlessly fascinating person and you’re just a lowly intern. I knew that I was supposed to be a quiet part of this process, only speaking when asking questions or prodding, but because I couldn’t see my interviewee, I did things like chuckle, say “mhmm,” and audibly agree with points. Hopefully this isn’t too noticeable to people in the future who may have to use my interview for research, but it meant that I got to hear my various noises and affirmations while editing and writing about the interview. There would be a nice anecdote, a good flow, and then my horrible chuckle. I don’t regret this sin as much because it actually did help to prove that I was present, it’s just not fun to hear yourself on a recording over and over again when you’re working on edits and writing the tape log. Don’t let my negativity affect your outlook on the interview process. I had a great time and learned more than just what not to do. Unfortunately these circumstances couldn’t be controlled but I couldn’t have asked for a more understanding and eager interviewee. I look forward to my next interview because the chances of snow are now minuscule so I have hope for a more personal and pleasant experience. Kate Dixon is executive director of the Friends of the Mountains-to-Sea Trail, based in Raleigh, N.C.
Kate Dixon moved to the Triangle about twenty-five years ago, and she has played a meaningful role ever since in shaping the natural landscape of this region and the state of North Carolina. Dixon started work for the Triangle Land Conservancy in Raleigh and later became that land trust’s executive director, helping the trust to conserve some 4,000 acres during her years there. She moved on from the Triangle Land Conservancy in 2003 to lead the Land for Tomorrow coalition, and then took her current job as executive director of the Friends of the Mountains-to-Sea Trail in 2008. The hiking trail runs cross-state between Clingmans Dome in western North Carolina and Jockey’s Ridge on the Outer Banks, covering some 1,100 miles through a diverse range of natural landscapes and local communities. The route currently includes approximately 620 miles of constructed trails, and hikers use designated low-traffic roads to cross the gaps between trail sections. Dixon and the Friends of the Mountains-to-Sea Trail (FMST) continue to work on closing those gaps by completing new trail sections, while a large network of FMST volunteers scrupulously maintain the existing sections. Dixon’s organization also has developed a large amount of detailed information about the trail for people who are interesting in experiencing it. Dixon recorded an oral history recently with the Southern Oral History Program, as one of the first interviews in a series at SOHP focusing on people actively engaged in environmental issues in the South. Dixon was born in 1959 near Princeton, N.J., in a community that remained quite rural during her childhood. She and her sister spent many hours playing in the woods around their home or riding horses, and long walks with her father through the neighborhoods, forests, and fields around Princeton also enabled Dixon to connect directly with nature from an early age. During her childhood, the Dixon family moved to New Delhi, India, for two years, then to Washington, D.C. – two highly urbanized settings where Dixon and her siblings nonetheless sought out green spaces to explore. In D.C., the family lived a block from the old Chesapeake & Ohio Canal along the Potomac River, which is a national park today. Dixon recalled playing along the canal structures, and the steep cliffs and a waterfall at the river where she liked to sit and “think deep, teen-age thoughts,” she chuckled. Still, Dixon also mentioned some specific issues and actions that she feels are critical, which could be seen as pieces of an overall vision, the “small part” of the larger issue on which she seeks to make an impact. For example, she pointed to all the driving that people do every day – including her own driving – and the related issue of auto emissions. She also talked about her love for working with the volunteers who maintain the Mountains-to-Sea trail sections and work on adding sections, and her love for engaging with residents in communities where new trail sections are envisioned. In those interactions, Dixon says, the FMST has an opportunity to help those local people put their own passion for the land into action. So working on her small part for Dixon means empowering volunteers and local residents, as well as protecting as much land as possible through the work of land trusts. At three in the afternoon on Wednesday, April 30th, our undergraduate interns from this past semester performed the oral histories of their interviewees. Aaron Hayworth, Katie Crook, Coco Wilder, and Turner Henderson had each conducted two interviews with people who had been a part of Chapel Hill’s gay community during the seventies, eighties, and nineties. 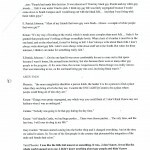 I explore some key excerpts from the script below. The excerpts are indented and italicized, and my thoughts will stay in the regular format. You can find short bios for each interviewee at the end of this post. Dawkins: I knew that I was attracted to men sexually, but I didn’t know exactly what it was. Carden: Well we weren’t into ‘out, o-u-t’ at that time….you’d get the hell beat out of you. There’s nothing more refreshing sometimes than to hear something like the above statements to bring us to attention. Carden: Chapel Hill was pretty liberal. Kenan: But it was still kind of hush-hush. E. Patrick Johnson: When I was here at UNC, there was no “coming-out process”. Nakell: I think people were a little cautious in those days about being identified as members of the CGA [Carolina Gay Association]. What would it have been like to be gay at UNC during this time? What would it have been like to be straight? 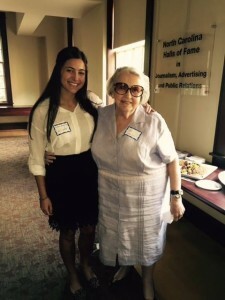 Nakell: I remember when I first became a faculty advisor to the Carolina Gay Association. I asked somebody…if he thought I’d lose any friends as a result of it. He said, “oh, you’ll probably get new ones!” Which turned out to be true! 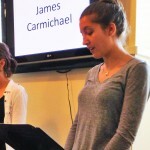 Carmichael: I just didn’t feel at home [at the CGA]. Kenan: Most of the gay black men I knew, I knew through the Black Student Movement choir. Phoenix: I didn’t feel like I fit in that crowd in the same way. So that’s what led me to create a network of gay people [at ECU]. Kenan: The CGA was more of a social function than a political one. Dawkins: Then people started getting sick….It was terrifying. Carmichael: Nobody knew what it was. Finally they came out and said the word “AIDS” out loud but AIDS wasn’t in the news yet. Of course President Reagan didn’t say anything for six years. Phoenix: I went to a lot of funerals. Kenan: Everything changed with AIDS and ACT UP and Queer Nation and all those people…There was a lag between Stonewall and that period…..Reagan was president, conservatism was on the rise. So, just speaking out…was a pretty radical thing. Phoenix: Buncomb had found the AZT medication which was the first medication that gave you a shot at not having a death sentence from AIDS, but it was priced so high…trying to make a profit rather than addressing the epidemic. Carden: You want something done you do it yourself. Phoenix: [we laid] down across the road where the service delivery trucks [for the pharmaceutical company] came in…like you’re going to have to run over us if you want to go in and out. But ultimately, these interviewees were not defined first by their sexuality, like many outsiders view them. People are people are people. Nakell: The law generally moves slowly and incrementally. And generally you want to take it step by step to establish…gay rights….I’m really astonished…with the speed at which it’s happened. It’s happening at lightning speed. Kenan: For gay people, I think we are in for a much longer slog than we realize, because, as Lyndon Johnson said about the Vietnam War, it has to also be about winning hearts and minds. And I think that the window dressing is cool, but a lot of hearts and minds are far from being changed. And a lot of political correctness is masking that. I worry. As fast as things are happening, I don’t know how real that is. Phoenix: We still have a tremendous amount of unemployment in the community, we still have…employment discrimination, we still have…discrimination in banking…and healthcare. John Dawkins sums it up best. Dawkins: The biggest problem that gay people have is just being able to live their lives without harassment and without being judged for being gay. That’s getting better and better, but it’s still got a long way to go. Applause broke out. Aaron, Katie, Turner, and Coco had done an excellent job of unifying the interviews while paying attention to their differences and they did it with empathy. For me, it clicked. Iris Murdoch wrote, “Love is the extremely difficult realization that something other than oneself is real.” It is important to connect the dots between the national (or state, or local) discourse on gay rights and the individuals themselves. When it’s someone you care for, the struggles of these people become more real. So it’s onward for the undergraduate interns, but speaking for the SOHP and the audience, we’re all grateful for the performance. E. Patrick Johnson attended UNC in the 1980s. Now a professor at Northwestern University, his most recent project is Gathering Honey, a performance based on oral histories with African American lesbians in the South. He is also the author of Sweet Tea: Black Gay Men in the South. Gary Carden has been a hair stylist in Chapel Hill since moving here in 1970. Carden was a pioneer in opening unisex salons and the gay bar, the Electric Company. Dr. Phelps Gates was a classics professor at UNC in the 1970s. His recollections of gay “hotspots” on campus are of particular import. Dr. Randall Kenan attended UNC as a student in the 1980s and is now a well-respected author and professor of English at UNC. Dr. James Carmichael attended UNC in the 1980s for his doctorate in library sciences. John Dawkins attended UNC in the 1970s and is now retired and living in Chapel Hill. 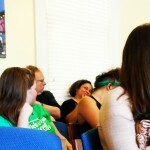 Dr. Terri Phoenix is now the director of the UNC-LGBTQ Center. 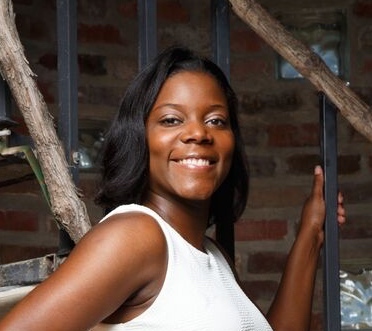 Dr. Phoenix holds degrees from three universities and has worked and lived all over the South. The LGBTQ Center recently celebrated its 10th anniversary. Phoenix was recently interviewed by Frank Stasio of WUNC. Barry Nakell is currently a layer in Chapel Hill. He was formerly a professor at the UNC School of Law and long-term advisor to the Carolina Gay Association. Attached are some pictures from the performance, the interior of the program, a snapshot of a page from the script, and a really neat visual that reflects the contents of the script (courtesy of wordle.com). 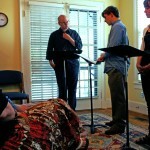 Aaron and Turner perform an aside in which E. Patrick Johnson and Randall Kenan’s comments play off of each other. 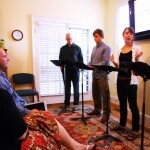 Aaron, Turner, Coco, and Katie (left to right) performing their oral histories. Katie Crook performs as James Carmichael. Malinda and Rob talk before the performance. The audience applauding the interns for their performance. The interior for the program. An excerpted page from Katie Crook’s script for the performance. 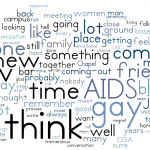 This is a word cloud of the most common words used in the spring 2014 performance script. You can see themes. 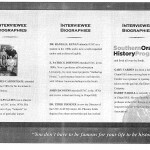 The academic year is almost at its end, but the work of the Southern Oral History Program keeps its steady pace. In January, I began as a field scholar mostly clueless about the project on which I was working. Now, after a few months gaining perspective in the workroom, I anticipate a summer spent collecting oral histories for the “Black Roads” project. Though eager to get out into the field, I am glad to have spent months working on better understanding the importance of the Southern Oral History Program. I have edited new transcripts and listened to many oral histories while simultaneously planning for summer fieldwork. My plans for this summer with Dr. Seth Kotch are shaped by the quality of the oral histories in the collections. We hope to expand the digital humanities aspect of the Program by video-recording onsite interviews for a web component in addition to collecting traditional oral histories. As we investigate issues of race and space in rural North Carolina, we consult an advisory board of transportation scholars, geographers, and noted experts of the rural south. With much excitement surrounding the project, I question the impact our efforts will have on the communities and people with which we work. As a social scientist, I am concerned with improving the communities I research. Just a few weeks ago, I attended a brown bag presentation at the Institute for African American Research where my concern was substantiated. Leaders of the presentation reported that communities and individuals in them often feel let down by academics who come in and leave without giving anything (whether it be a gift card or a relationship) to the people being researched. As I sat in on the discussion that followed the presentation, I considered what I could do to in interest of having people who I interview feel good about working with me. After listening to oral histories here at the SOHP, I realize that for many, the opportunity to share stories and have others listen may be of unquantifiable importance. The value that sharing has is noticed, and unfortunately, the SOHP often has to turn down solicitations for oral history projects due to a lack of time and resources. As I get closer to going into the field, I hope to be mindful of how I operate as a researcher concerned with doing good. However, I will also be mindful of how great it can feel to to have your story recorded and shared.